How can Yoda get kids to read? That's the question that the non-profit American Library Association (ALA) asked in 1983 for National Library Week. The organization created a series of 40 "READ" posters featuring celebrities like Paul Newman, Bette Midler, David Bowie, George Burns, Bill Cosby, Sting and Goldie Hawn reading books. They also used fictional characters like Miss Piggy, Kermit, Mickey Mouse, Goofy, Muppet Babies and Curious George. 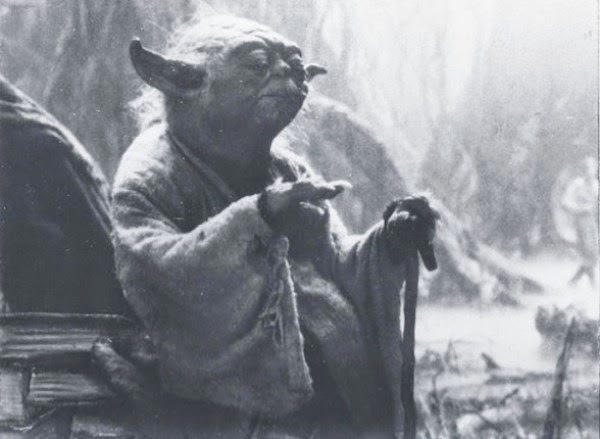 In 1987 they decided to use Yoda. 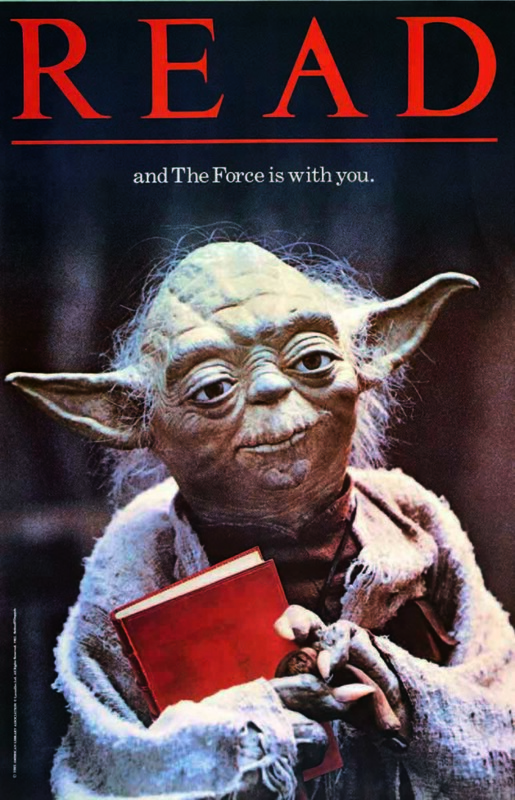 The iconic 22" x 34" poster of Yoda holding a book was an instant hit and can still be seen hanging in libraries around the country. But a few other ideas floated around and last week StarWars.com dug into the old Lucasfilm archive files and uncovered some early concept images for the campaign. 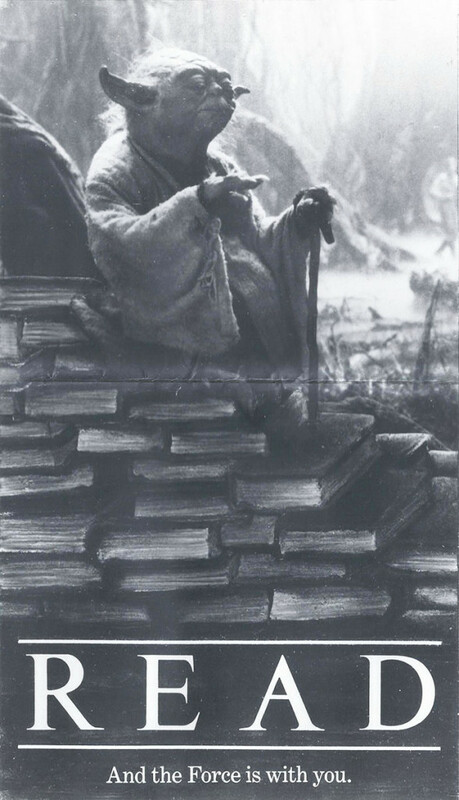 Lucasfilm originally told the ALA not to have Yoda holding a book, so they designed these posters of Yoda relaxing on a bookpile and floating a book. Clearly not an abuse of Jedi powers of course. 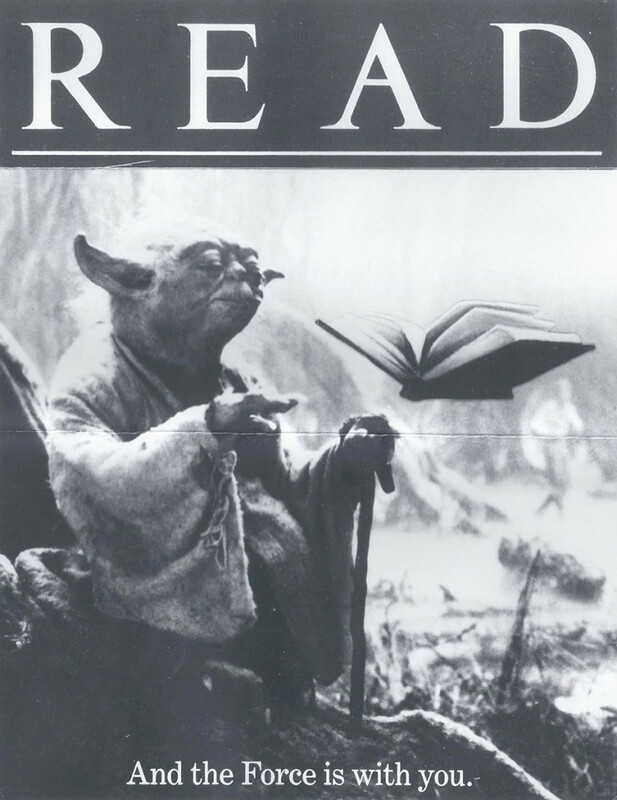 In the end a designer decided to try having Yoda hold a book and the image was so perfect that it stayed. What do you think of the poster designs? Did this Jedi mind-trick convince you to read? I think either of those ideas would've worked. I wonder why they didn't want him holding a book? I think I would have read more if I thought it would give me the Force. A journey...in your mind...will you take. I remember the poster. I'm sure it got me to read more sci fi titles. I would have loved a Yoda, Miss Piggy crossover poster.